Movable Panel with title bar. Returns the pathname that was used to load the child window. When the child window has not been loaded yet then this function will return an empty string. Returns the height of the title bar. Returns the transparency of the window. width Sets the width of the child window. height Sets the height of the child window. backgroundColor Sets the background color of the child window. pathname The path to the folder that contains the images for the titlebar and an optional background image. The folder must also contain an info.txt file, which will give more information about the child window. Changes the background image of the child window. This image will be scaled to fill the whole window. Passing an empty string to this function will remove the current background image. Change the height of the title bar. The default height is the height of the title bar image that is loaded with the load function. Changes the transparency of the window. By default all objects in the window are drawn fully opaque, but with this function you can make them semi-transparent. This function no longer works like expected. This is the cost for the performance improvements that I made. 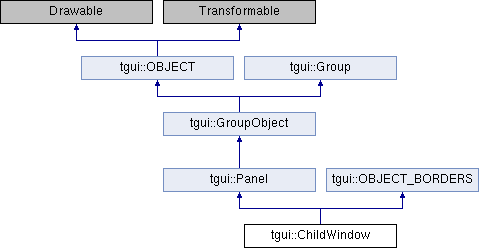 The next version of tgui will reimplement transparency (but for ALL objects) without losing performance while not used. The color that is used to draw the borders of the window. The distance between the side of the title bar and the close button. Should the close button be on the right side or on the left side of the title bar? Should the text be on the left or the right or should it be centered?